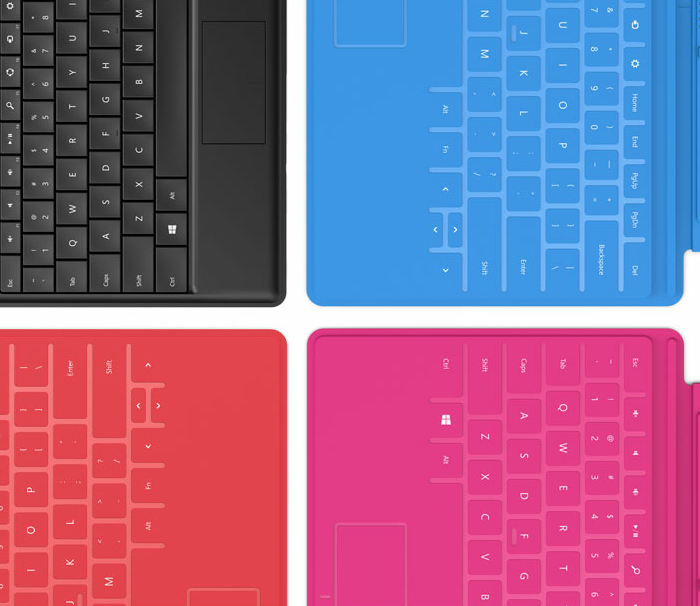 Here are a few more hidden tidbits about Microsoft's new Surface tablets, launched in Los Angeles on June 18. Yesterday Microsoft announced it would be making two Windows tablets of its own -- one Windows8-based and another Windows RT-based. Today, pundits, partners and potential customers are sifting through thousands of articles, the streaming video feed of the announcement and online documents for more particulars about the coming devices. Availability: The official word is "Surface for Windows RT will release with the general availability of Windows 8, and the Windows 8 Pro model will be available about 90 days later." Microsoft still has not said when general availability of Windows 8 will be; the widely circulated rumor is October. If that is accurate, it means Microsoft could miss a big chunk of the holiday 2012 sales window with the Windows 8 Pro model, as it won't be out until some time in December. Pricing: Another case where there's no real answer yet. "Suggested retail pricing will be announced closer to availability and is expected to be competitive with a comparable ARM tablet or Intel Ultrabook-class PC. OEMs will have cost and feature parity on Windows 8 and Windows RT," according to Microsoft's press release. Company officials are not sharing any guidance beyond that at all. Manufacturer: Who is actually making these new tablets? Microsoft designed and "engineered" them. But who is building them? No comment from Microsoft on that one. I'd love to know when and how Microsoft told its other OEMs of its plans to do its own tablet. There were rumors of this happening a year ago. Distribution: Microsoft's official word is "Both (Surface tablets) will be sold in the Microsoft Store locations in the U.S. and available through select online Microsoft Stores." Will they also be sold in other stores and outside the U.S.? After all, there are still relatively few Microsoft Stores out there (unless you live on the West Coast of the U.S.). I asked about other distribution plans and got a no comment. Office 2013: Yesterday was the first time that Microsoft officials went public with the fact that the version of Office that will be "included" with Windows RT will be "Office Home & Student 2013 RT Preview." Office Home & Student is Word, Excel, PowerPoint and OneNote -- the same four apps Microsoft officials said last year would be "included" with Windows RT. (We still don't know precisely what "included" means -- downloadable from the Windows Store? Preloaded? Free? Microsoft officials still won't say. But the more interesting word here is "Preview." I've seen many speculating that Microsoft would rush Office 2013 (Office 15) to get it out by the time Windows RT is generally available or delay Windows RT until Office 2013 was released to manufacturing. The word I've heard is Office 2013 won't even be released to manufacturing until November this year, with general availability slated for early 2013. That explains why a "Preview" will be what's "included." I'd think Microsoft would push the final bits to customers via the Windows Store once they're available. Cameras: There are two cameras on these tablets. Both the front-facing and rear-facing ones are Microsoft LifeCams. One might think Skype VOIP integration is now guaranteed, but there was no word of that yesterday at all. The "old" Surface products. The Samsung SUR40, the smaller and lighter version of Microsoft's Surface multitouch tabletop, is no longer sporting the "Surface" branding. Instead, it's now officially PixelSense. The Samsung SUR40 with Microsoft PixelSense is the official name of the device launched in January this year. The old Surface Twitter handle is now "mspixelsense." There's a new Surface twitter account, but it's locked and hasn't accepted any followers so far. More Surface hardware to come: It seems like the two tablets announced yesterday may just be the first of a number of Microsoft-Surface-branded hardware -- at least based on this press release tagline: "Microsoft-made hardware to be available starting with release of Windows 8 and Windows RT." (emphasis mine) Maybe there will be other Microsoft tablets, PCs... maybe even phones introduced as part of the new Surface family. Why Los Angeles: Many of us guessing in advance as to what Microsoft might be announcing on June 18 figured the location, Los Angeles, implied there'd be a heavy dose of entertainment content and partnerships to go along with whatever else was unveiled. Microsoft hardly mentioned entertainment at all, other than to announce Netflix was doing a Windows 8 app. No Hulu. No Disney. No Xbox Music or Xbox Video demos or additional details. So why LA? A Microsoft spokesperson said the company chose LA because it had good production houses, a great venue (Milk Studios) and was an easier place to keep things secret. And the most pressing question of all -- Why no brown Surface tablet cover: There will be a handful of Surface touch-cover colors from which to choose. But no brown. Microsoft's been there and done that. Maybe they could try again but call it "UPS Brown" this time? What other interesting omissions and factoids have you found in your Surface search?